Russia’s new carrier Azimuth Airlines has taken delivery of its third Sukhoi Superjet 100 (SSJ100) regional aircraft. On August 13 the airliner arrived at Azimuth’s home base Rostov-on-Don from Ulyanovsk, where it had been painted in the operator’s livery. Built in 2014, Azimuth’s third aircraft was previosly operated by Yamal Airlines. This extended-range version (SSJ100LR) seats 103 in a single-class layout. The previous two Superjets (numbers RA-89079 and RA-89080), one of which is also an LR, were delivered factory-new. The carrier is building an all-SSJ100 fleet. It has a total of eight airframes on firm order from State Transport Leasing Corporation (GTLK). Eight more are to be ordered later, with letters of intent for four each already signed with GTLK and directly with SSJ100 OEM Sukhoi Civil Aircraft Company. The lessor for the latter agreement has not been announced yet. 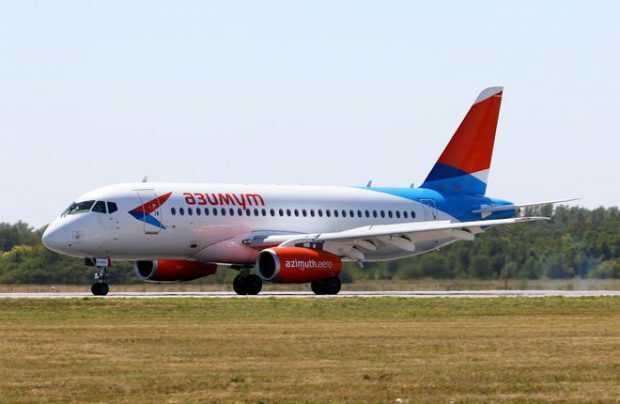 Azimuth Airlines was founded by Vitaly Vantsev, co-owner of Moscow’s Vnukovo airport, and Pavel Udod, formerly deputy director at Yakutia Airlines. The vision for the airline is to develop air services in Russia’s Southern and North-Caucasus federal districts. Operations should launch in September 2017. In December the carrier will move to Rostov’s new airport, Platov. Azimuth has contracted Engineering Holding to keep its aircraft airworthy while based at the city’s old gateway. The provider has opened a line maintenance station at Rostov-on-Don International Airport. At Platov, the airline will maintain its airliners on its own.